Having recently had the rather gruelling last minute task of unearthing somewhere to stay over the Easter weekend, it became obvious to me that for some reason this time of year for Capetonians is synonymous with the Cederberg (myself included) – it’s a case of have holiday will go to the Cederberg. Let me first clarify that I am a huge Cederberg fan (it was my first port of call). That part of the country is beautiful, and easily accessible from the Mother City yet allows a complete escape into wilderness, up mountains and passes and through little towns that allow one to play, albeit briefly, at country living for a few days. But this propensity for one destination above others means that towns like Ceres end up with the monolopy. Hence rates for long weekends rise to almost double – there is little supply and a huge demand. Thankfully, there are other places that hold as much peace and inspiration for travellers. 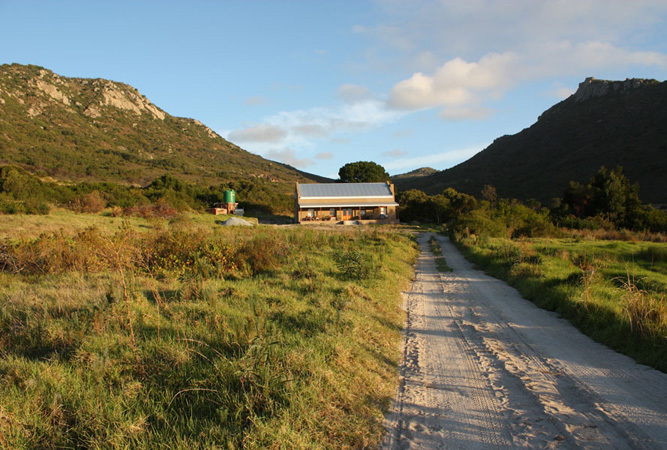 Off in the middle of nowhere, on a gravel road part way between Gansbaai and Baardskeerdersbos is a 800 hectare nature reserve filled with fynbos and the odd mountain peak. 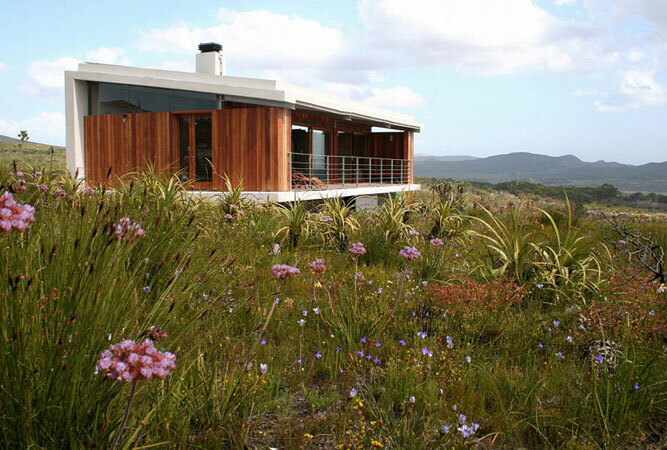 In the midst of this already attractive sounding destination are three modern and private freestanding fynbos suites – bedroom, bathroom, lounge with fireplace. Along each suite’s length is a covered deck and a sun-deck. A boardwalk will link you to the original residence where meals are served made from local ingredients in a dining room with sweeping views. There’s a lap pool, but don’t mistake this for a resort for nature rules supreme here. A little piece of heaven. This 2000 hectare property right in the heart of the Bainskloof Road is a wealth of fynbos, trees, shrubs and nature as it is intended. Bastiaanskloof has some incredible mountain hikes and trails and two rivers, hence a myriad natural pools and waterfalls. A selection of five self-catering cottages are at your disposal, set within an indigenous landscaped garden where a short walk will bring you to the Witte River and a series of natural pools. Cottages are private, fully equipped and sleep between two and eight people. India House, in particular, gets rave reviews from previous guests. 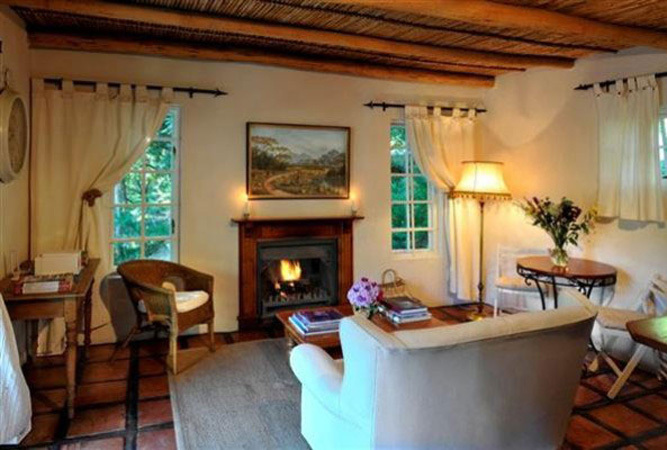 Little Willow Brooke is within easy walking distance of Franschhoek’s hub, yet in atmosphere, miles from anywhere. Perched above a bubbly stream that meanders through a rush of oak and willow trees, Willow Brooke is a cute Cape-styled country cottage with a green tin roof, rough white-washed walls, wonky terracotta paving, rietdak ceilings and cottage furniture. Ever dreamed of feeling as though you’ve woken up to star in Story of an African Farm? But without the dust. Fynbos Estate lies on a grape and olive farm, only just over an hour from Cape Town, with its own little winery. For hire is a Victorian manor that can sleep up to sixteen people, but ten or twelve is as comfortable. It’s the perfect go-away-with-a-group-of-friends type home. But if that doesn’t grab you, or you simply want something smaller, then there is a charming little cottage just next to it that accommodates between two and four of you. And you can choose whether you’d like to self cater, part cater or even be fully catered for. Walk around the beautiful farm, or taste the wine made under the Dragonridge label for a truly unpretentious weekend away from it all. 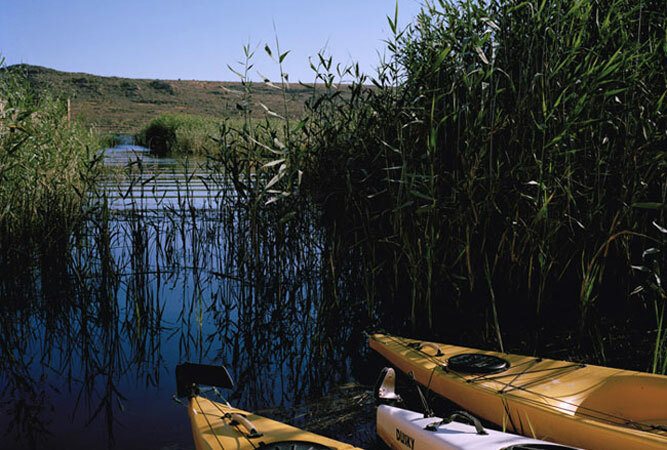 Situated right on the Verlorenvlei, a stretch of natural wetland that is also a Ramsar site, it doesn’t come much better than this for getting away from it all. 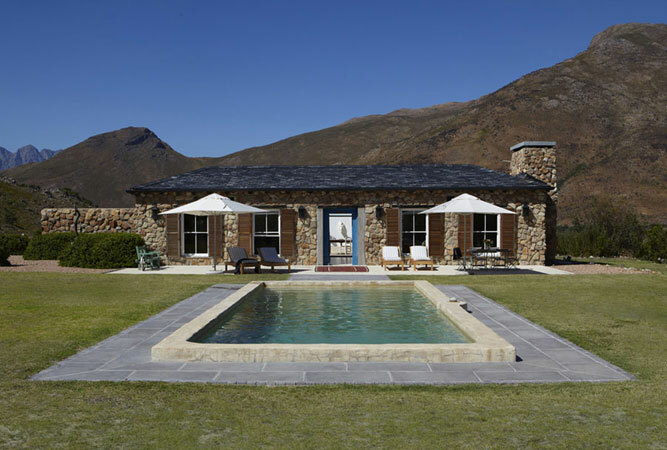 Ventersklip promises four restored hostoric cottages that date back to the early 1800s, but they also do six luxury private campsites with ensuite bathrooms, two individually screened campsites (shared facilities) and another nine normal size campsites that share facilities. All camping overlooks the vlei. The on site Tin Kitchen serves local, organic meat and fish dishes with vegetables and salad grown in their own garden, from a 300 year old barn with shaded seating and pretty lawns on which to relax. Book your Western Cape Accommodation and other Cape Town Hotels on SA-Venues.com where you Deal Direct and Save!